This past week I read a really interesting article by Peter Fingesten: “Topographical and Anatomical Aspects of the Gothic Cathedral.”1 Fingesten feels like the form and design of Gothic cathedrals have allegorical and symbolic meaning. He compares the interior of cathedrals to the anatomy of the human body (in essence, as symbols of Christ and/or the Virgin Mary). He also compares the exterior of cathedrals to mountains, finding a link between Gothic cathedrals, the Heavenly Jerusalem, and the “sacred mountain imagery” that existed in ancient cultures. This imagery, according to Fingesten, is largely inspired by the John the Revelator’s visions of the Heavenly Jerusalem (Chapter 21 of the Book of Revelation). I thought I’d briefly mention a few of the main points here. Before reading this article, I already was familiar with how the floor plan of a basilica can mimic the form of the cross, or even the body of Christ. The allegorist William Durandus (also sometimes written Guillaume Durandi or William Durand) said as much in the 13th century. 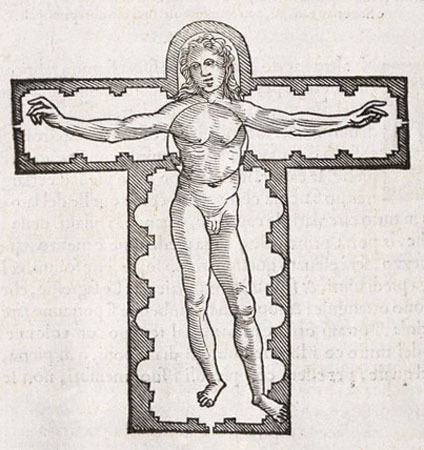 Fingesten asserts this point, and even references Vitruvius and the Renaissance artist Pietro Cataneo’s “Vitruvian Figure”(1554, see above), which is depicted within the basilica floor plan. But Fingesten takes things further: he discusses how the ribbed vaults of cathedrals mimic the spinal cord and ribs of a human figure. 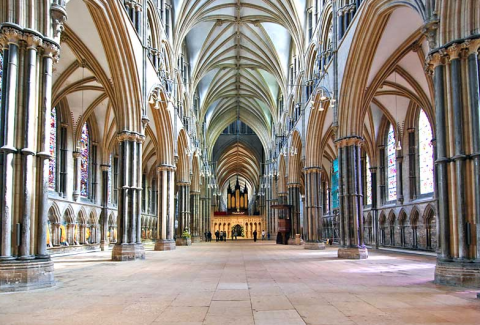 He believes that the Lincoln Cathedral interior (shown at the beginning of this post) is the best expression of this anatomical imagery. Fingesten also believes that the stained glass windows represent the translucent skin of the human body. It’s a really interesting and unique argument, I think. Fingesten delves into some textual references (beyond the Book of Revelation) to back up his argument. I’m not going to delve into those here, but you are welcome to read the argument on your own. My main concern is that Fingesten doesn’t convincingly have his own argument align well with what Durandus wrote in the 13th century. (For example, Durandus compared stained glass windows to the scriptures, not to translucent skin.) That being said, though, I think Fingesten’s interpretation of the cathedral is very impressionable. I know that I’ll think about rib-cages and mountains the next time I visit a Gothic cathedral. 1 Peter Fingesten, “Topographical and Anatomical Aspects of the Gothic Cathedral,” Journal of Aesthetics and Criticism 20, no. 1 (1963): 3-23. Justinian Mosaic Altered Not Once, but Twice! 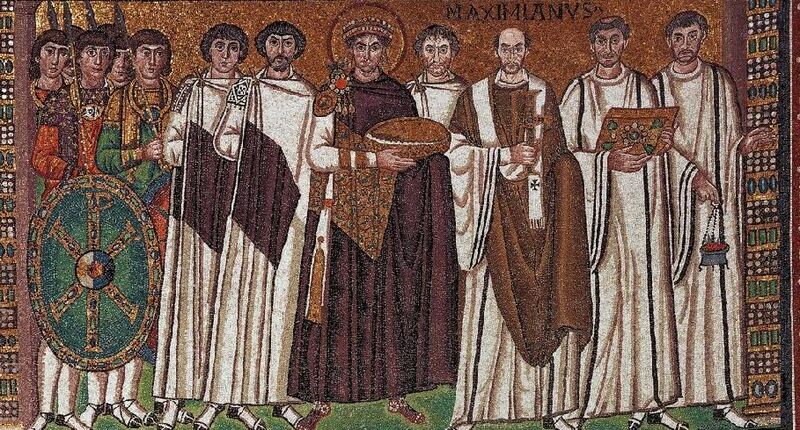 Detail of Justinian and His Attendants, wall of the apse of the San Vitale Church (Ravenna), c. 545-546. 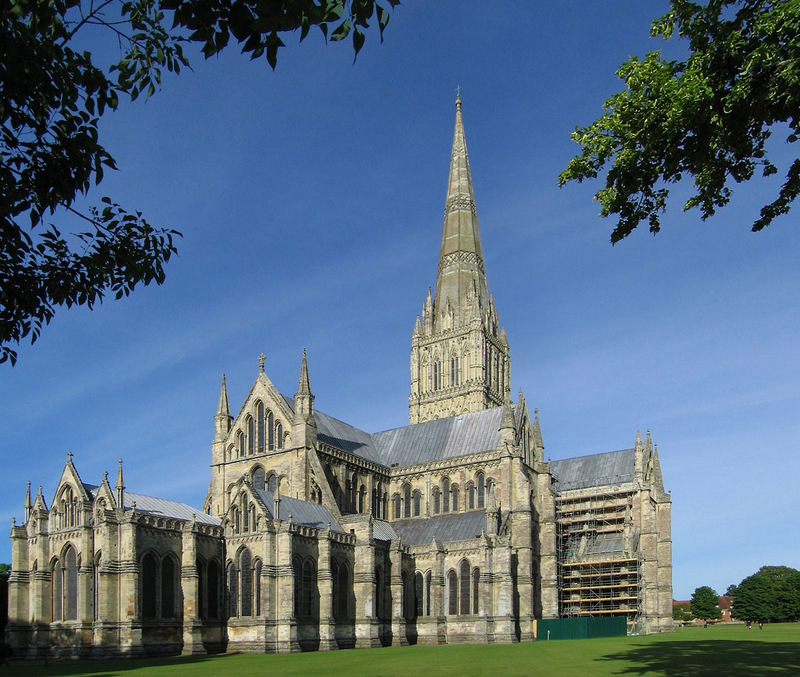 Church consecrated 547. Some alterations date c. 1100. 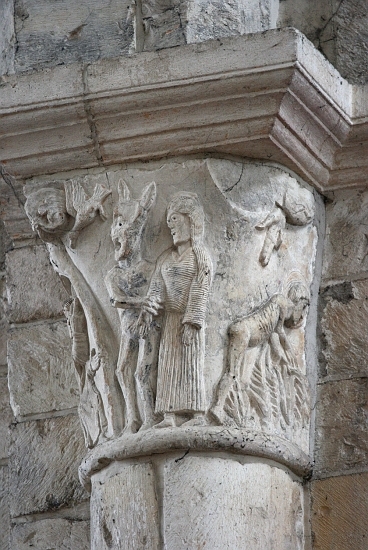 Another one of the early modifications was the inclusion of a courtier who stands in between Justinian and the bishop (see above). If you look closely at the overall composition, you’ll see that this individual does not have any feet (which can be explained with the understanding that this figure is a late addition). 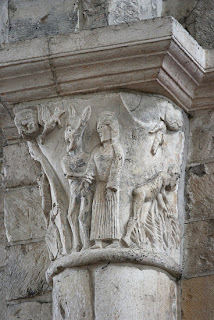 It is thought that this figure represents John the Nephew of Vitalian, who was second in command to the commander-in-chief of Italy (the latter is thought to be depicted on the right side of Justinian, wearing a beard). Maximian may have seen potential in John the Nephew’s power, and therefore decided to include him in the composition.2 Although it does seem like it would be humiliating to be included in the background of the composition, John the Nephew did get a prime location between the emperor and archbishop. However, in addition to these early alterations there are some other alterations to this mosaic which seem to have taken place several hundred years later, probably around 1100 CE. Isn’t that interesting? 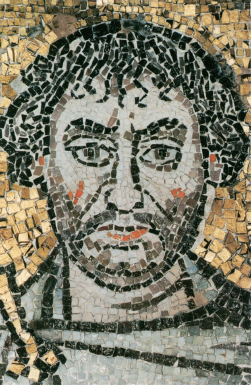 In the 1990s, scholars Irina Andreescu-Treadgold and Warren Treadgold published results on some technical analyses of the Justinian mosaic. The publications revealed changes in the scale and materials of the tesserae that were used.3 Based on these studies, I wanted to present some of the medieval restorations that took place. One of the interesting additions in the c. 1100 restoration is the tonsure (shaved top of scalp) which was added to one of the deacons on the right side of the mosaic. Although the origins of the tonsure are unclear, I am not familiar with any examples of the tonsure that exist before the 7th and 8th centuries. (If anyone does know of examples, I’d be interested to learn about them!) It’s important to realize that the tonsure might not have existed in the sixth century, when this mosaic was originally made! 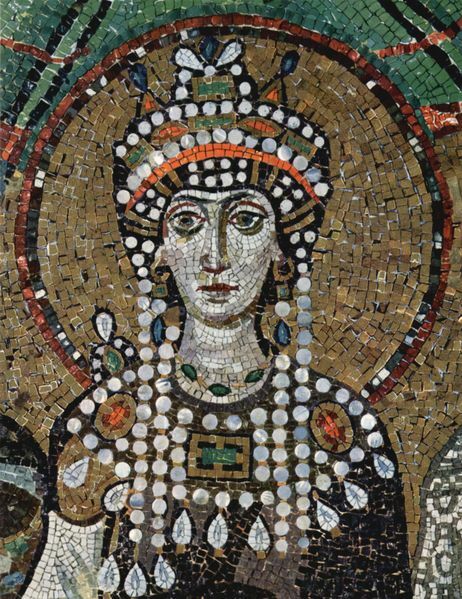 Other medieval alterations include the emperor’s crown, which apparently was simplified and diminished in scale (although it is interesting to note that Empress Theodora’s crown, depicted in another mosaic in the San Vitale apse, is an original). A fibula (or brooch) was also added to Justinian’s attire in this later alteration (see above). 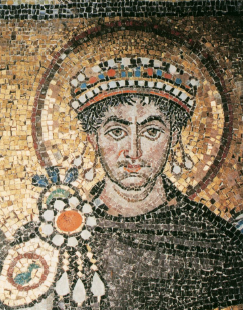 I think that this inclusion of the fibula is rather interesting – perhaps the mosaicists wanted to visually compensate for the fact that they gave Justinian a smaller crown? Finally, the smaller pieces of tesserae at the beginning and end of the Maximianus inscription indicates that there was an alteration in this place, too. Isn’t it interesting that we can deduce through formal and technical analysis that this mosaic was altered several hundred years after its creation? The nuanced history of this mosaic makes me love it all the more. What do you like best about this work of art? 1 Irina Andreescu-Treadgold and Warren Treadgold, “Procopius and the Imperial Panels of S. Vitale,” The Art Bulletin 79, no. 4 (1997): 721. 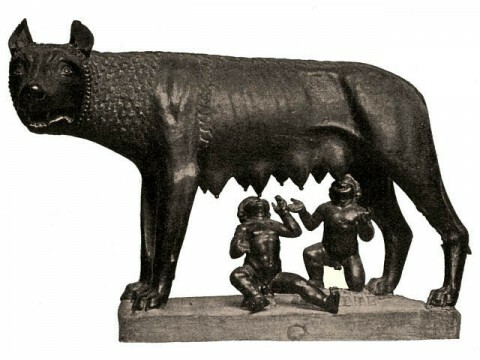 Maximian had been barred from Ravenna because he had supported Justininan’s Edict of the Three Chapters. The inclusion of himself with the emperor in this mosaic serves to visually reinforce Maximian’s support of the emperor. 3 Ibid. 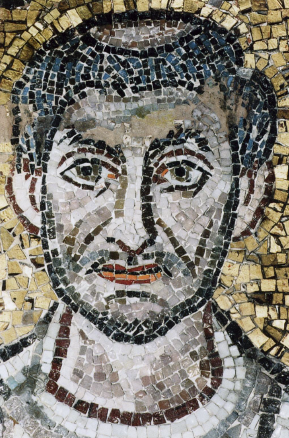 See also Treadgold, “The mosaic workshop at San Vitale” in A. M. Ianucci ed., Mosaici a San Vitale e altri restaur. Il restauro in situ di mosaici parietali, Ravenna, 1992, pp. 31-41. The restoration is also briefly discussed in Sarah E. Bassett, “Style and Meaning in the Imperial Panels at San Vitale,” Arbitus et Historiae 29, no. 57 (2008): 56. Book of Kells Folio 34 Description! I sometimes have trouble finding satisfying discussions of illuminated manuscripts in general art history textbooks. I have found that many descriptions, while very informative about a specific illumination or artistic style, tend to focus on illuminated manuscript pages as isolated works of art. Although I realize that such isolated descriptions are part and parcel of the general survey textbook (it’s impossible to discuss everything in depth! ), I still am a little disappointed. I feel like medieval gospel books were meant to be experienced as cohesive whole, not as merely isolated illuminations. 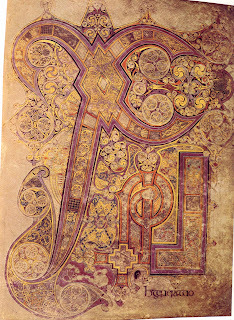 One such example of an isolated description can be found in a recent edition of Gardner’s Art Through the Ages, which discusses the “Chi-rho-iota (XPI)” page, folio 34 recto of the Book of Kells (c. 800, shown right). Although I really like that Gardner’s touches on historical context by explaining that this particular passage would be read on Christmas Day, I feel like a sense of the illustration within the biblical text and Book of Kells itself (as a whole) is relatively lacking. Have you found any descriptions of illuminated manuscripts that you like? Do you know of other descriptions that help the reader to better understand either the biblical context or the folio’s physical context within the gospel book itself? 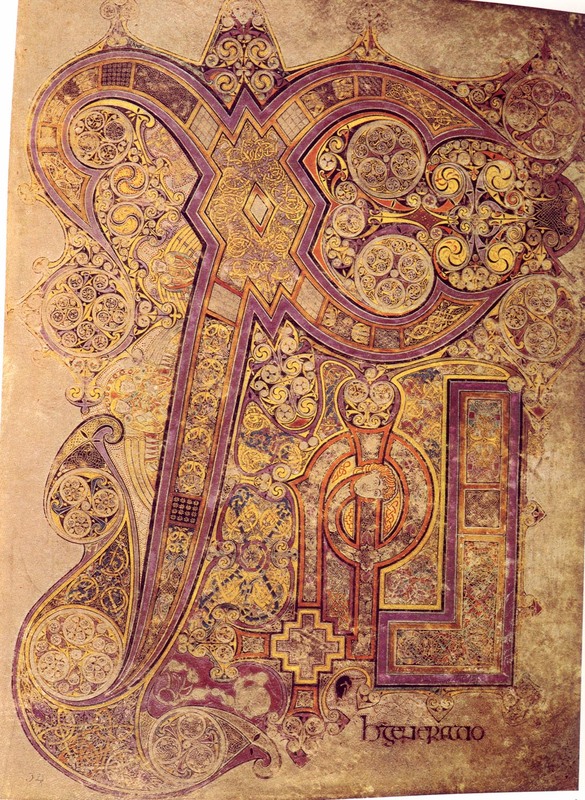 UPDATE: The Book of Kells is available online as a digital copy through the Trinity College Library in Dublin (which has the book in its permanent collection). You can see a high-res copy of the Book of Matthew, for example, with Folio 34 HERE. The library also has provided an introductory page to the Book of Kells. 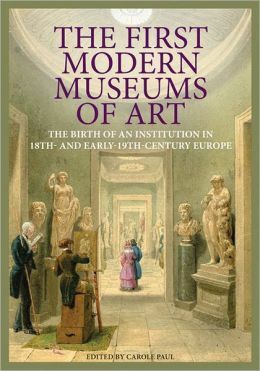 1 David G. Wilkins, Bernard Schultz, Katheryn M. Linduff, Art Past Art Present, 6th edition, (Upper Saddle River, New Jersey: Prentice Hall, 2009), 171. I have a new appreciation for St. Benedict of Nursia (480-547 CE) this afternoon, just having spent a few hours pulling wild thornbushes out of my backyard. I think that is the most grueling and painful exercise I have ever had while gardening, even though I was equipped with gloves and protective clothing. But back to St. Benedict: while battling these bushes, I couldn’t help but think of the the saint. 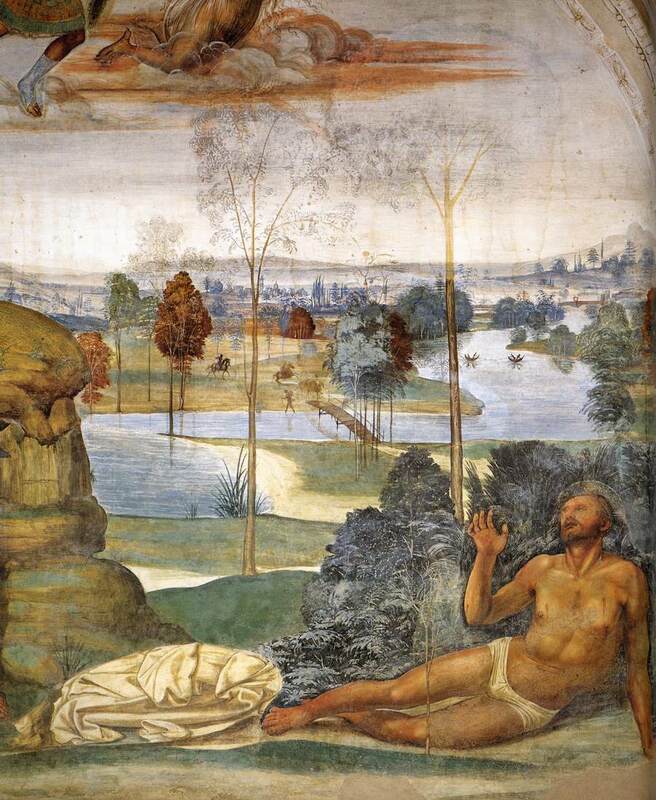 According to legend, Benedict cast himself into a thorn bush while naked, to escape the wily temptation of a woman. When I discuss Benedict in my art classes, I sometimes joke with my students that the thornbush experience was the early equivalent to “taking a cold shower” today. (And it was, at least for some monks!) But since this morning I have a new appreciation for thornbush hoppers. Anyone who willingly throws himself into a thornbush – with the intent of getting pricked – deserves sainthood in my opinion. Definitely. I thought it would be fun to post some images of Benedict and the thornbush. I was only familiar with a few examples before writing this post, and frankly, I’ve been surprised that I can’t find more works of art dedicated to this legend online. Perhaps monastics wanted to remember that Benedict overcame temptation, but not necessarily focus on exactly how he overcame temptation? Or perhaps there are more images that exist, but they are cloistered away from the public eye? Any medievalists have thoughts on this topic? Although I don’t think this painting is fantastic, I think it’s interesting that the artist included a thorny bush on the side of the painting. This painting depicts Benedict writing his sacred maxims and precepts; these Rules have come to be part of the foundation for monastic living in Western society. I found another fresco described online (without an image, unfortunately) at the Subiaco Monastery, just southeast of Rome. 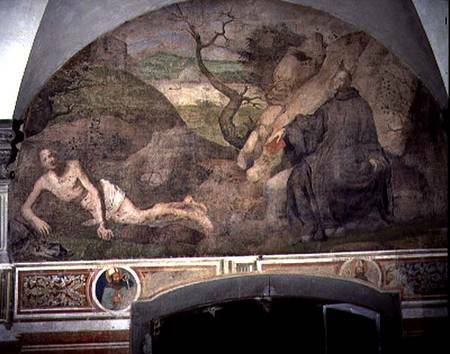 In this fresco, Saint Francis is grafting roses onto the thornbushes into which Saint Benedict threw himself. I think that the choice of Saint Francis is especially appropriate, since Saint Francis was also known to throw himself into thornbushes to avoid sexual temptation. The Minneapolis Institute of Arts has proposed some interesting symbolism for thorny plants, given this context of Saint Francis and Saint Benedict. It may be that in some situations thorny plants symbolized chastity and virtue, since these plants functioned as an aid for sexual abstinence!